Artificial intelligence algorithms could soon take over the duty of reviewing speed camera and red light camera tickets. Officials in Saudi Arabia and France have investigated the use of AI to further automate the processing of citations generated by automated ticketing machines. 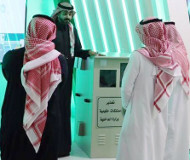 Photo enforcement vendors demonstrated the technology last month in the traffic safety pavilion of the Al-Jenadriyah national heritage festival outside Riyadh. The new technique uses machine learning algorithms to analyze speed camera video, processing the images to determine whether it is possible to issue tickets for failing to wear a seat belt or using a cell phone behind the wheel. At least initially, a human would sign off of the tickets in bulk before the system mails out fines. Any false positives would be fed back into the system so that the self-learning algorithm can adapt and avoid similar mistakes in the future, according to proponents. The same error detection system would also be used to "double check" tickets that have already been reviewed by human employees. Once confident in the use of the technology, however, officials expect to replace human review with the AI program. The French government is offering automating ticketing vendors a special contract to develop an AI review system. "The Ministry of the Interior through its National Agency for the Automated Treatment of Offenses wishes to develop an artificial intelligence that can associate photos from automated cameras with vehicle registration information in order to reduce the sending of tickets to drivers who did not commit an offense," the request for proposals stated. The notice admitted that automated ticketing machines in France each year falsely accuse 10,000 motorists of speeding or running a red light. "In many cases, it is a misreading of the plate that causes the error," the notice explained. "The ticket is then sent to registered owner entered in the vehicle registration database and not to the person who actually committed the offense. However, a technique exists to identify misidentified plates: compare the numbers on the plate to the model of associated with the vehicle."